Look what sprouted on the southern section (next to the shore) of the island in the lower lake: Sarracenia Purpera a/k/a the Purple Pitcher Plant. We’ve been rounding the island in our 14 foot Gillgetter or kayaks for ten years now. Long Lake continues to surprise. The deep burgundy color before the petals unfurl may be designed to look like, well, raw meat. 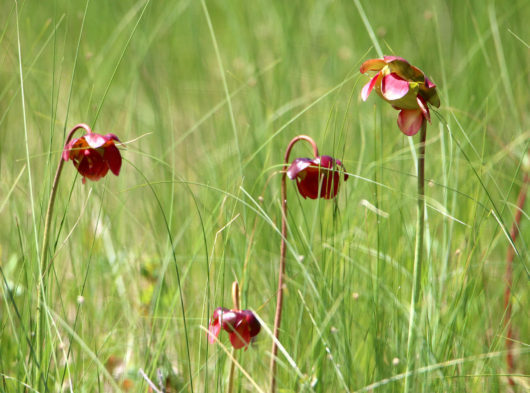 Check out figure seven in this article for confirmation of what we’ve got and for a good and somewhat disgustingly amazing discussion of how the Pitcher Plant attracts and digests its prey. In addition to the look-like-raw-meat trick, it lures bugs like flies and ants partly with the alluring scent of its prior-trapped decaying prey. Waxy slippery surfaces inside this beauty eventually lead to a pool of water that then can’t be escaped because the plant hoses down its visitors and prevents even flies from just flying away. If the bug does escape the pool, it still has to climb steep leaves. Since flies can’t hover like dragonflies or helicopters, this doesn’t go well for them. And if bugs manage to escape the leaves, there’s still those downward pointing hairy bits. The exhausted bug eventually gives up, drowns, and get digested. Apparently Purple Pitcher is a fairly common wildflower in the bogs of the northeastern part of the United States. I’ve never seen it though. Here’s more info on the Sarracenias. And some great photos. Once I figured out what they were, I couldn’t stop reading up on them. But I’m not planning on adding any to my tabletop bouquet.